Freckles was an amazing mother who usually had triplets and raised them brilliantly; here she is in 2006 with twins. Thunder booms at daybreak. The shepherd awakes and listens. There’s the spattering tap of rain on the roof and lightning flashes—a spring thunderstorm. Rain drums and then steadies into a shush. He stares at the ceiling. “This is our first due date,” he says. “Lambs are out there being born in this.” His wife rises. “At least it’s not snowing,” she says. He pulls on his canvas overalls and goes for his jacket. In the kitchen Mister Coffee gurgles and moans. The shepherd steps onto the porch, and, finding the air mild, feels thankful. He makes his pasture rounds, the rain gentle. No new lambs. A white yearling who lambed two days early hovers over her twins. The brown-spotted male, his legs braced, punches his mother’s udder like a flyweight hammering a heavy bag. The smaller roan ewe lamb sits hunched like a sodden rabbit. Water drips from the brim of the shepherd’s hat, and beads of water roll off the shoulders of his slicker. He surveys the bent and bitten glistening grass. He must move the flock before any more births and nudge the new mother along. Yet he lingers in this spell, in the hushed dignity the rain has lent this April morning. When I was growing up in Satellite Beach, Florida, the nearest sheep had to be 100 miles away. Grieving for the farm we’d left in Georgia, I’d drag out Dad’s old farming books and moon over pictures of blocky whitefaced Herefords. I even memorized breeds of swine, admired the chickens. But sheep? The breeds looked too much alike in the grainy black-and-white photos. A poor fantasy livestock. It took me years to learn that they don’t all look alike. Or behave alike. To see how fitted to my hill country they were, how fitted to a small farm’s infrastructure and human muscle. To discover, in short, the hidden beauty of sheep. So I’m a tad defensive when people ignorantly disparage sheep. I was guarded when estimable rural writer Verlyn Klinkenborg pondered sheep in his New York Times column this past Sunday. But after warily reading his piece, I can tell he’s working himself up to get sheep—in both senses: to begin to raise them and so to become a fan. Because they are a great species—and fully smart enough to be successful sheep. How smart do you require the animals you eat to be, anyway? Can you decode their complex, ongoing body language? Grasp the dozens of messages passing between a ewe and her newborn lamb? Grunts, bleats, tail flicks. Nudges, licks, baas. Freckles taught me to honor maternal ability. Daily sheep humbled me with their fleeting displays of joy, their stoic dignity, their calm presence, their acceptance, and their gentle egoless group mind. My pocket lambing notebooks, cheap spiral-bound Oxford booklets from Wal-Mart’s shelves, are enchanted. Even now, years later, I can open them—the dog-eared pages smudged by dew and birth fluids; smeared with blood and dirt—and hear lambs crying and their mothers baaing and see a ewe licking her newborns in the sun. The chunky notebooks contain data: birth dates, weights, tag numbers. And scrawled exhortations: Great mother! 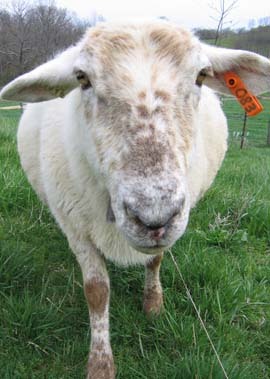 or Cull this ewe! 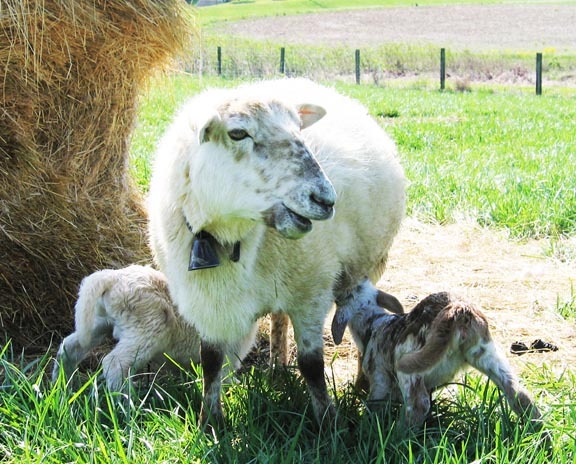 Lambing season’s chaos, drama, and abundant living gifts made it almost unbearably exciting. How I do miss it this mild April morning. This writing is so beautiful it made me cry. I don’t know if it’s the words or the longing for something other than a cubicle—a bigger square, a bigger patch of green. Your words, like your animals, are beautiful, and I can’t wait to meet all of them. Thanks so much, Leslie. I sort of feel like crying myself for that period now gone, and have tried to put it my book, reflected here. Soon I hope to announce the home my forthcoming memoir has found. It seemed urgent to me to tell about certain things, and that urgency kept me going through six drafts, seven years. I like the way, Richard, that you describe the animals not only in warm, animal-loving terms, but also in practical terms that acknowledge what we actually use and need from sheep in addition to the love for them that we show. It makes the whole experience more genuine, and adds a bittersweet note to what you say about them (for after all, yes, we do eat them, or at the very least remove their warm “clothes” for ourselves to use). I think this is the correct note to strike for a farmer, who must be aware of both qualities. It speaks of reality, in short. I look forward to hearing about your full memoir, and hope you have more to tell us of your farm. Thank you, Victoria—you have read between the lines very sensitively and express well the paradox of livestock husbandry. As I explain in the book, I came to see that only my love for these animals could answer to the sacrifice they make. Their species chose ours 10,000 years ago, but our part of the bargain is very large, I think. At the least, to let them express their essential natures in green fields. Brings back memories of my sheep raising days in Northern Vermont where lambs were born inside the barn, sometimes at 3 AM, often in subzero temperatures. Witnessing those tiny miracles being born filled my soul to overflowing. Oh yes!! Barn lambing in the winter. The classic and still probably favored approach. As a grass farmer, I timed lambing to occur in sync with spring grass. But there are tradeoffs, like not being able to hit the big Easter market. The juxtaposition of your poetic images coming straight from your kind, honest shepherd’s heart with the heartless cruelty at the Boston Marathon is staggering. Is it possible that humans developed from two completely different trees? I stood in the growing dusk this evening from inside the house and watched a doe and her yearling come inside the open gate to graze. Every few minutes the yearling would race around then come back to join its mom. They seemed fascinated by the flickering images on the television, which they could see through the sliding glass doors. I thought: I’m glad they don’t know. I meant to say — Freckles has the sweetest face. Thanks, Beth. I think I posted this before the attack, which I didn’t learn about till very late in the day, and I’m glad. Not sure I could have posted something about such innocent creatures after Boston. Richard, you prove that nostalgia does not have to be sentimental and that sentiment in the sure hands of a farmer-writer can be trusted. I am standing in line to read this book! I love every character so far. Beth is right about the contrast to the horror of the daily news. I am comforted in such times by my belief that Kindness wins in the end. I can’t help but connect Freckles to the lamb upon the throne in Revelation, if you don’t mind my hauling in the KJV. Richard, Thanks for stopping by my blog, One Rich Life. I love your blog. Always good reading and mind expanding thought. Thanks. But aren’t you glad you’re lifting small, Oxford spiral-bound notebooks nowadays instead of pregnant ewes? Thanks, David. You know, my book is about that very subject, nicely summarized in your phrase. It seems raising sheep has its own language. I’ve never raised sheep or heard “barn lambing” before. But I do live on a horse farm and love living among animals and their different personalities. Decades ago we raised cattle, and the family dynamic among the herd amazed me. Btw, I’ll be in line right behind Shirley to buy your memoir. Looking forward to reading her book as well. I hope to make an announcement soon about my book’s home, Darrelyn. All species have their virtues, truly. I was scared of horses but had to honor their beauty. Cattle the same, plus my father was a cattleman (and a skilled horseman but he’d had enough bad incidents that he wouldn’t let us ride, growing up). Like most farmers, though, I became somewhat of a species chauvinist. But sheep were a real surprise to me at first. Richard – As you know my Mother raised sheep as I was growing up in rurla Ohio. I have very fond memories of lambing season. And, i have irritated teen memories of being torn from my warm bed in the middle of a cold night to help a ewe in trouble. I loved this piece as it reminded me of those times, but more importantly of my Mom. Those %^&*@ sheep were among the loves of her rural life as she was of mine. I await the memoir and hope to add it to my summer reading list. Ah, the classic farm experience! I’d forgotten your mother raised sheep, Kate. As for my book, more like NEXT summer! Richard–Your piece was much more pleasant than today’s reality–45 degrees and pouring rain on my pasture lambs. Miss Freckles and miss you as a shepherd. Ha! I miss you too, El Supremo.